In preparation for fibreglassing the interior of the hull I sanded the double layer of fibreglass tape along the seams. I also ran the angle grinder along the edges of the tape to smooth them out a little figuring this would help get the glass inside the hull a bit more fair. Doing this also allows the cloth to bond smoothly, preventing any air pockets from forming. 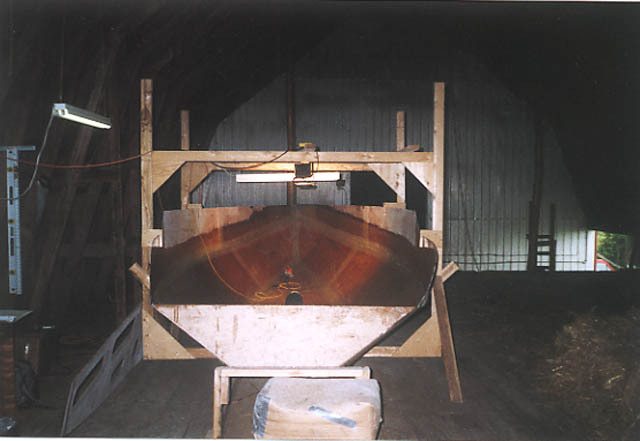 Once the hull was prepped I began the process of laying and wetting out the fibreglass cloth. Working my way fore to aft I would unroll a few feet of the 12 ounce biaxial cloth from the bolt and hold it in place with a few strips of duct tape. To wet the cloth I’d use a cheap paint brush to apply the epoxy and then using my trusty bondo squeegee I would move it around to get things smooth. In the beginning I was leaving a bit too much epoxy but after a few batches I had figured out the right amount of pressure to apply to get the cloth properly bonded. I ran out of time one evening while in the middle of applying cloth along the port side and the wet epoxy wicked its way a couple of inches up the cloth. This resulted in a few bubbles in the fibreglass where I resumed the process. Taking the wise advice of some of the bateau2.com builder’s forum members I later ground the bubbles out (by this point the angle grinder had become my new favourite tool) and patched them leaving a good sized overlap. In this manner, I sheathed the entire inside of the hull and after things had fully cured I busted out the orbital sander and roughed things up a bit. Next I decided to fill the weave of the fibreglass with a thin coat of epoxy which went on fairly quickly. Then again with the sander. I honestly don’t mind the sanding process too much – it certainly isn’t difficult work – but it is tedious. Probably the worst part about it is that the reverberations from the sander inside the hull overwhelm the stereo. hey andrew, In hoping for more picuteres at the various logs you are holding…. Thanks Thijs! I’ll do my best to be more diligent with the camera this coming season. I’m looking forward to hearing about your build as it begins. Beginnning can be the hardest part! Best of luck. I also live in the Montreal area. I was wondering if I could get to see your boat sometime. I am quite willing to give you a hand for a day (maybe more) for the pleasure of seeing your creation. I have built a ‘birder 2′ a sixteen foot open kayak. Absolutely! I’m sending ya an email.